The very last of the snowdrops have just gone over. Delayed flowering has made for the loveliest and unlikeliest of bedfellows: snowdrops on crocus, daffodils and tulips emerging together with the hyacinths, and delphinium foliage that’s now growing like a rocket. With so much noisy life finally breaking the winter silence, I’ll be free of all the planning and the purchasing — mostly bulbs, mostly unnecessary, but what else was I supposed to do in January? — and can start planting. My enthusiasm for the Eatin’ Project is growing — just. After all the faff with early vegetable seedlings and sorting the raised bed, I’m feeling protective towards these baby plants. That said, I have turfed them into the bed already — heavily protected winter cos lettuce, with a pot of carrot seedlings at the middle — both to see if they’re made of strong stuff and because the lettuce, for one, really did look ready. The carrot container is raised that extra bit above carrot fly altitude, and the seedlings are inter-planted with spring onions to throw any highfliers off the scent. It just doesn’t feel like gardening. In my greenhouse are glossy hellebore seedlings, hair-like snakeshead fritillary seedlings that have just emerged after a year in pots, and white cosmos planted just weeks ago which is already pushing up its first leaves. I look at them and I feel actual joy. 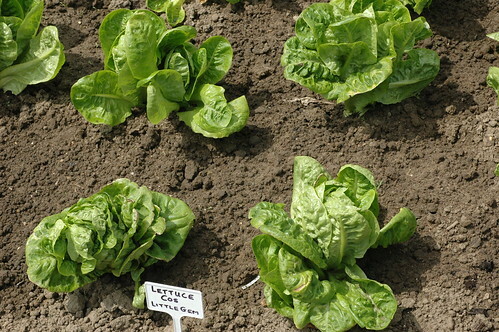 They’re all sharing the greenhouse with the newer cos lettuce seedlings — but I look at them and I feel nothing. I think it’s because the lettuce has no prospect of being beautiful. This afternoon I let out a yelp when I saw my first morning glory “Grandpa Otts” seedling raise its heart-shaped head. I consider this the most beautiful seed-grown plant in my garden, with violet flowers so intense they make me feel my vision is being pulled to the end the spectrum. My passion for roses, too, is down to the aesthetics: the first time I saw the David Austin Roses catalog, I couldn’t believe anything could be so beautiful. I do like the ferny carrot foliage, and the strawberries I’ve edged the bed with (thanks for the idea, Grace) are pleasingly pleated. But the aesthetic aspect of the vegetables I’m growing is pretty rubbish. The two pear trees I’ve put in are a different story: I love the progress of their lengthening, pointy buds and I know blossom is on the way. I need to persist with this project. And last weekend it was a bit thrilling to plant some vegetable seeds with my three-year-old daughter. “I’m a gardener!” she said. That’s my girl. What’s your feeling about the beauty of vegetables? Do you need beauty in the plants you care for? Can you give plants the love they need if you don’t admire them? Two weeks is much more of a gap than I’d ever expected to leave between posts — sorry. January-February were a bit alarming in work terms, and I now know what the clock on my desk looks like when it strikes 11 PM and beyond. My gardening has been confined to stolen moments of web research, so it was a thrill last week to pause my work schedule to visit a garden centre for the Eatin’ Project. My mission: find liquid seaweed to fortify my thin-necked cos lettuce seedlings and another tier to raise my raised bed. Am I the only one who struggles with garden maths? Turns out my Haxnicks foot-deep raised bed isn’t. It’s six inches deep. My topsoil calculations were hilariously wrong. No one is impressed with the gigantic sack of topsoil I’ve left idling in the neighbour’s driveway, but finally I have another raised bed tier. Gordon the gardener will now help me distribute topsoil mountain all about, and if the weather plays ball I may get a few of those cos in, probably under cloche, probably after warming the bed a bit. (Note, I never saw a reply from Haxnicks following my query to their website about tiering, despite the jolly auto reply that promised immediate gratification. @haxnicks, for shame!) My Parmex carrot seeds have also germinated; next stop, spring onion junction. The minarettes can be planted as close together as two or three feet, trained straight up or (as I’m planning) on an angle. I came so-o-o-o close to quince “Vranja”, with its intoxicating tropical scent, but finding a dwarfing rootstock proved extremely difficult, and I didn’t fancy years of hard pruning to keep a more vigorous “A” rootstock specimen in this tiny space. Wait, can you hear it? The grindstone is calling me back, and I need to put in a few more hours’ writing before I sleep. But please, please do tell if you have experience with “Concorde”, “Williams’ bon Chretien” or any minarette fruit. Did it perform for you? And is the taste of Williams’, in particular, going to be worth my three years’ wait? A few summers ago a ceramic strawberry container sat on the whisky barrel by the back door, with a bright crop of lettuces I’d grown for summer salads. At the time my husband and I were big on the Atkins diet and meat-laden salads were a great favourite. I was fascinated that they grew so easily from seed and did come again after cutting, and the feel of their firm leaves as I rinsed them under the tap was hugely satisfying. This feedback aside, I probably would have tried lettuces again if the strawberry pot hadn’t perished that winter, because they were beautiful. Truthfully, vegetable growing — and can I just say that I cannot abide the word “veg” — leaves me cold. Seeing vegetable coverage in the media is like contemplating my tax return; I glaze over. Partly this is because my attempts at peas, carrots and potatoes have given hilariously small yields, but mostly it’s because I’ve seen so few lovely examples of vegetable growing. Come hit me, Alys Fowler, with your TV series in January, because I desperately need convincing that I can do edibles beautifully. Did you see this month’s Gardens Illustrated profile of Alys — the one that calls her “steely” — where she opines that it’s “slightly immoral” not to at least try to grow some of your own food? Yes, yes. My garden’s lack of fruit and vegetables makes me feel ashamed and unfashionable, all at once. But 9.5 out of 10 examples are visually awful and make a strong feature of bird netting and horticultural fleece. There’s no part of my garden I want to see draped in prophylactics. So I’m now devouring information about doing vegetables beautifully, and my interest is piqued. I thought this planting (pictured) of kale and marigolds at RHS Harlow Carr this summer was a great example of what can be done. But I constantly garden against the clock — am I crazy to think about creating a potager-style space, edged with herbs, stuffed with edibles and beneficial flowers? I could make it easier on myself by siting my vegetable experiment in the sunny, sheltered square between the driveway and back gate and by using raised beds; I saw how fertile these can be when I helped with my local school garden. I think I’m going to get out the pencils and measuring tape and start putting something on paper. Those stripey tomatoes, frilly asparagus peas and funky red Brussels sprouts in my Good Ideas for Your Garden book do look comely. I think, just maybe, I could even grow to love them.